Florida’s New Tourism Slogan: The Good Dog State. This month, the Governor’s Office of Tourism, Trade, and Economic Development might want to consider re-branding the Sunshine State to the Good Dog State. From Jacksonville to West Palm Beach, Tampa Bay to Orlando and everywhere in between, Florida is chockfull of dog friendly events. What’s more, if you’ve been thinking about bringing another dog into the family, October is Adopt a Shelter Dog Month. Many of the events this weekend and next will have rescue groups and their adoptables on hand. This is Petey, available for adoption through All Dog Rescue of Florida. Over the last couple of weeks we have met some pretty amazing people who donate whatever time they have to volunteer for various rescue groups. Of course, we’ve met some pretty incredible dogs too. Like Petey, who was abandoned as a puppy along with his mom, both found wandering the streets. All Dog Rescue of Florida is fostering Petey, and has already put $800 into him for his medical treatment. And still, his adoption fee is only $300. So, in your travels over the weekend, should you happen to attend one of the following events and come upon a rescue group, please drop a dollar or two in the donation jar. Petey (and many more like him) will thank you with puppy love and sweet kisses. While you’re out and about on Saturday, October 20, you will definitely work up an appetite. And that’s a good thing, because our best event pick of the day is happening at the Clearwater Quaker Steak & Lube. Don’t miss the Red Hot Rescue Chili Cook Off from 1p until 6p, hosted by the Florida Great Pyrenees Club. There will be some delicious samplings from some pretty competitive cooks, along with live entertainment, rescue groups, raffle items, giveaways, auctions and demonstrations. Not only will you satisfy your appetite, but your heart and soul will be filled up as well. All proceeds will benefit the participating rescue groups. If you happen to be traveling through Lutz on Saturday, you might think you’re seeing spots. You would be right, since Dalmatian Rescue of Tampa Bay will be hosting their annual fundraiser, Dal-loween at Lake Park just off North Dale Mabry Highway. This is another one of those rescue groups whose volunteers have worked tirelessly over the years, and this is the one event that helps them sustain as a 501c3 all year long. Go, Spots. Go. About 2000 people and hundreds of their dogs are expected to be at the Shell Factory’s Doggy Heaven this Saturday, October 20 for Goldenfest, hosted by Golden Retriever Rescue of Southwest Florida. If you know Golden Retrievers, you’ll love that one of the offerings throughout the day will be Pet Brushing and Furminating. The Shell Factory (located in Fort Myers) is also home to SunCoast DockDogs, so demonstrations and competitions will be held. Other organizations on hand with adoptables: SW Florida Wiener Dog Club, Healing Paws-Ability Agility, Gulf Coast Humane Society, Grey Muzzle, Labrador Retriever Rescue of Florida, and the Pitbull Crew of Florida.If you happen to stick around through Sunday, check out the Doggie Church, a half hour non-denominational service held at 12:30 pm. By the way, our choice for dog friendly hotel accommodations would be Hotel Indigo, just minutes from the Shell Factory. Maybe you’re a fan of the low-riding wiener dog. You’re in luck. The annual Dachstoberfest takes place on Sunday, October 21 between 10a and 2p at Centennial Square in West Palm Beach. There will be a Dachshund Parade, Doxie Dash Race, and a Costume Contest Competition conducted by The New Barker rover reporter and award-winning photographer, Tina Valant. Proceeds from this event benefit Dachshund Rescue of South Florida. Tina will also be handing out complimentary copies of The New Barker while supplies last. Travel tip: You’ll receive a delicious brunch during your stay at Hibiscus House B&B in West Palm Beach. Your dogs get to wander around the lushly landscaped, fenced-in yard, while you dine poolside. We’re betting that the biggest gathering of dogs and people in Florida will take place this Sunday, October 21, at the 12th Annual Stride for Strays 3k Walk and Fundraiser for Animal Coalition of Tampa. Curtis Hixon Park on the Riverfront is one of the coolest venues in Florida. Stride for Strays has proven time and again, to be one of the most entertaining, fun-filled afternoons for the entire family. The Doggie Fun Zone will be set up for Agility demonstrations, and there will be plenty of food available (including vegan-friendly menus). Be sure to check out Groovy Cats & Dogs and Lucky Dog Daycare for specials and treats. Also this Sunday, The Jacksonville Landing is hosting their 4th Annual Howl-O-Ween Bash and Yappy Hour between 2p and 5p. This has become known as the Largest Dog Costume Contest in Jacksonville. Complimentary copies of The New Barker will be available. Travel tip: Hotel Indigo does have a Jacksonville location as well. Pitbull advocate and singer/songwriter John Shipe will be coming to Florida next weekend, courtesy of Pitbull Happenings. He will be at the 4th Annual Dogtoberfest at The Shops of Wiregrass, a daylong adoptathon on Saturday, October 27 with multiple rescue groups from all over Florida on hand. The event is hosted by Animal Based Charities. For more howling good times, be sure to check out The New Barker calendar. Spooktacular picks, including the 6th Annual Barkoween, hosted by Fluffy Puppies, and A Pawsitively Posh Halloween Party, hosted by Pawsitively Posh Pooch are always good bets for a whole lotta fun. One Lucky Dog in St. Petersburg and Wet Noses Boutique in Sarasota are each hosting their own dog-friendly Halloween Parties, as are Pet Food Warehouse, Gone to the Dogs Boutique, What A Dog Play Center and The Doggie Door. Whatever you do, wherever you go, be safe. Florida dogs are counting on you to look out for them (and to not leave them behind). For now, we’ll leave you with a funny (yet, sadly true) PSA from The Shelter Pet Project. 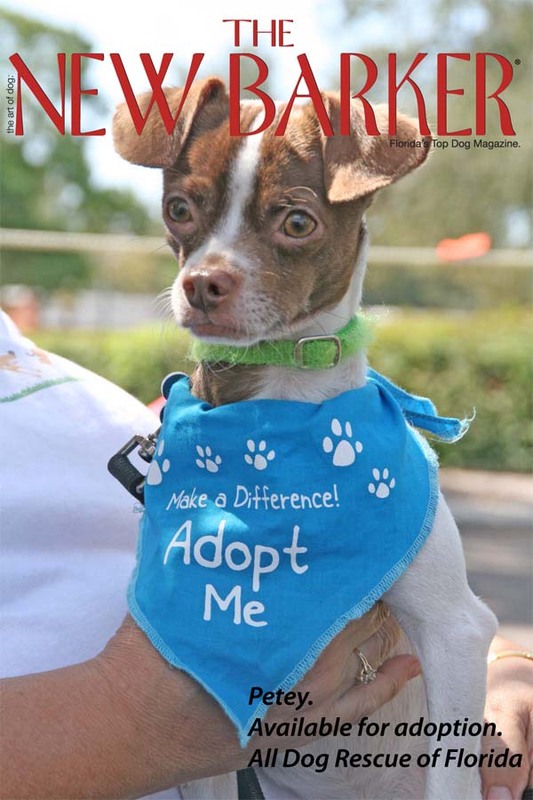 Author Anna CookePosted on October 19, 2012 Categories "The New Barker dog magazine", Dogs, Florida Dogs, Florida's top dog lifestyle magazine., The New Barker dog magazine, The_New_Barker, The_New_Barker_Dog_Magazine, UncategorizedTags Animal Based Charities, Animal Coalition of Tampa, Dog, Dog Magazine, Dogs, Florida, Florida dog, Florida Dog Magazine, Florida Tourism, Fort Myers, fun with dogs., Governor Rick Scott, Governor's Office of Tourism, Hotel Indigo, Jacksonville, John Shipe, life with dogs, lifestyle, Pit Bull, Stories about dogs in Florida, Stride for Strays, Sunshine State, Tampa, The New Barker, The New Barker dog magazine., The_New_Barker, Tina Valant, Trade and Economic Development, West Palm Beach1 Comment on Florida’s New Tourism Slogan: The Good Dog State.